Locupletissimus Thesaurus: continens Varias & selectissimas Benedictiones, Conjurationes, Exorcismos, Absolutiones, Ritus, Administrationem Sacramentorum, aliorumque Munerum Pastoralium, Ad Utilitatem Christi Fidelium, & commodiorem usum Parochorum, omniumque Sacerdotum, tam Saecularium, quam Religiosorum Curam habentium. by GELASIUS DE CILIA [Gelasio di Cilia] (1654-1721). Ratisbonae:: Radlmayr, 1756., 1756. Eighth edition. Small 8vo. 774,  pp. Head and tail pieces. 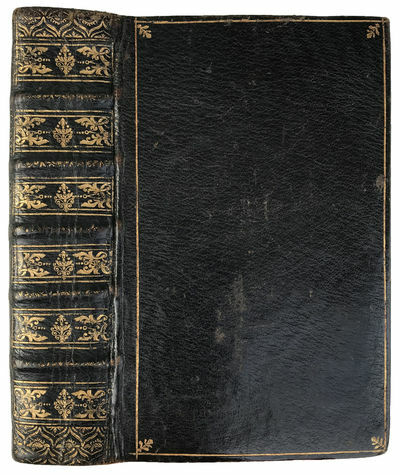 Handsomely bound in full black morocco, gilt rule surround, corner fillets, raised bands, gilt spine compartments, all edges gilt. Ownership signature of the Ecclesio Parochialis in Wolterdingen [Germany], 1757. Lovely copy. A "CURIOUS TREASURY OF BENEDICTIONS, EXORCISMS, CHARMS, &C.": Contains a widely ranging series of benedictions and rites: "Gelasius de Cilia, in the curious Treasury of benedictions, exorcisms, charms, &c., gives several in which the titulus in introduced; for instance in the exorcism of the charta, or written charm, efficacious against demons and spectres, which commenced with a cross placed, like the little crucifix on the cross found at Clare. . . In the Benediction against Tempests we find the sentence - 'Jesus Nazarenus Rex Judeorum, - Titulus triumphalis benedicat et custodiat nos ab omnibus malis;' and in the solemn Exorcism of persons bewitched ('contra omnia malefica') the demon was adjured 'per triumphalem titulum,' which is directed to be written on the forehead of the sufferer." - p. 67. "Gold pectoral cross found at Clare Castle, Suffolk." The Archaeological Journal: Published Under the Direction of the . . . , Volume 25. London, 1868.